PRODUCT DESCRIPTION: Aerosol which has a very low odor and is applied much the same way one sprays a can of hair spray. Bedlam Plus is Non-Repellent to Bed Bugs, is water based and will not stain water safe fabrics and surfaces. Bedlam Plus may be used on bedding and fabric, including curtains (if you are unsure if a fabric is water safe, test in an inconspicuous surface before making an application). 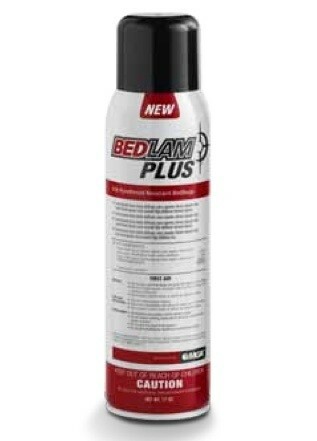 Bedlam Plus is a followup to the ever popular Bedlam which is one of the most successful bed bug products on the market with the main difference being that Bedlam Plus includes a second active which an easily handle pyrethroid resistant bedbugs and other pests. TARGET PESTS: Bedbugs, Carpet Beetles, Clothes Moths, Bird Mites, Dust Mites, Lice, Ticks and Fleas and other crawling insect pests. RATE OF APPLICATION: A can will treat several rooms if you need to use it all at one time but the good thing about this product is that you control how much is used. That being said, one can will not properly treat over 1500 sq/ft so don't spread it too thin. But you can use it to treat small areas several different times. The main feature is that Bedlam will last up to 4 weeks per application. This means that you will not need to treat every night. It is good when used in conjunction with a full bedbug or carpet beetle program or as a preventative measure when bringing in new furniture, moving, traveling, etc..
We use Bedlam Plus as part of a preventive treatment plan for carpet beetles. It's easy to use, dries quickly, with low to no odor. Best of all, it works! Excellent! This stuff is great. How safe is this for animals? Will I need to take them out of the home? I have been treating my home for a year every 3 months via a bug company and the carpet beetles always return. The cost is outrageous and the treatment obviously isn't working. Did you view the "safety" video above? It goes over all you need to know. Basically you'll want to have them out of the rooms you treat and then allow the treatment to dry. That usually takes 1-2 hours and after that, they can come back into the area with no areas. So if you confine them to one room, you could then treat all other areas and once that's done, keep them out of the one room still needing work. The liquid options are far more cost effective compared to aerosols. And they work better for sure. Is there a similar can-based application for Nyguard available? I wanted to get the bedlam for a small area but also wanted to apply IGR as well. Thanks. In fact there are two forms of Bedlam. Regular Bedlam has only the adulticide. But Bedlam Plus (above) has both the adulticide and the Nylar (egg controlling active) included so this is all you need. Can I use Bedlam Plus to treat my clothes and tents for bedbugs or permethrin from Sawyers? Sawyers permethrin? If you review the Sawyers label, you'll note it does not list Bedbugs. The reason for this is simple; Bedbugs are not easy to control and weak formulations of permethrin have proven to be ineffective. Flawless service. Received my carton of bug death. Rugs are sprayed. We await the outcome! Great information from the staff! Flawless Service! Received my carton of bug death. Rugs are sprayed. We await the outcome! Great information from the staff. We have used this spray to get rid of carpet beetles and their eggs. It works wonderfully. I would highly recommend this spray! I found this product very helpful and reach for it whenever I see a moth or moth larvae, which has been very rare. I believe I have eliminated my problem but still continue to look so I can tackle it before it becomes a problem. Tags: bed lam, bedlam plus.